No time during the week goes faster for me than Sunday morning. It seems that on Sunday, it is always noon. If I wake early, then I feel like I have time to go out to breakfast, which often leads to errands, and before I know it it is noon. If my dogs let me sleep, then I leisurely read the paper and putz around the house, and before I know it, it is noon. If I have obligations in the afternoon, they are upon me before the day really gets started because I feel like those morning hours somehow evaporate. Do you have an equivalent to Sunday morning? If a block of hours seem to fly by, could you do something less desirable during that period and get it out of the way? Could you utilize the time in a different way and become more intentional about its use? Or do you allow it to be your recreational respite and do more productive things at other hours? Like with money, becoming conscious of how you are using you time is the first step in becoming intentional about how you spend it. I recently attempted to call my sister Meg via the voice recognition software in my car. “Call Meg,” I said. “Calling Susan,” the auto-voice responded. “No, call MEG,” I said again. “Calling Miron,” the computer said. “No, call M-E-G,” I barked. “Calling 9-1-1,” it said as ringing began. A minute later, I had a call from Sgt. Mike at the Jo Daviess Sheriff’s Department wanting to know if everything was alright. I think about the things that were automated in the name of efficiency that often require more energy than the manual version of the same thing. > Voice recognition software that never did call M-E-G and instead involved the sheriff. > Auto-flush toilets that often flush two or three times while you are in the stall. > Motion sensitive lights that come on when a plastic bag flies through the yard. Automated does not necessarily mean better. Sometimes the old fashioned way really does have its merits. Just ask Sergeant Mike! How did Tom Turkey make a presentation yesterday? Though the wonders of technology, of course. Thanks to a fun app MyTalkingPet, you can make a recording and it appears that any animal is speaking. I received a version from my dog, asking if she could have a treat, and then another one from my other dog who wanted me to come home and play. In addition to amusing emails, the app can be used to make inanimate animals talk. We have plans to deliver a message from our mascot; it was used to have an inflatable snowman deliver a holiday greeting, and it’s how Tom Turkey could describe a cooking contest entry. If you want to have your dog tell your kids that Santa is watching or tug on someone’s heart strings with an “I love you” message from their pet, this app is a winner. Think about adding a whole new dimension to your communication messages through its use. For most families, the only competition that occurs today is on the gridiron. Not so for the Cirks’ clan. For the past 7 years, the siblings and siblings-in-laws have tried to best each other to win the coveted ceramic turkey award for the best entry in the family cooking competition. Each year, a different category is designated and a rubric developed for judging. Last year, a dessert had to include instant mashed potatoes, pomegranate, cottage cheese and chocolate. This year, contestants will display their candy or cookies and be scored on the following: representative of Thanksgiving, taste, creativity, appearance. Even the family members who are unable to attend are expected to participate via Skype. Two bonus points are allowed, so grandiose presentations usually accompany the dish. Last year, the winner built a fire so others could roast homemade marshmallows as part of the dessert. I believe Tom Turkey himself may be making a presentation this year. 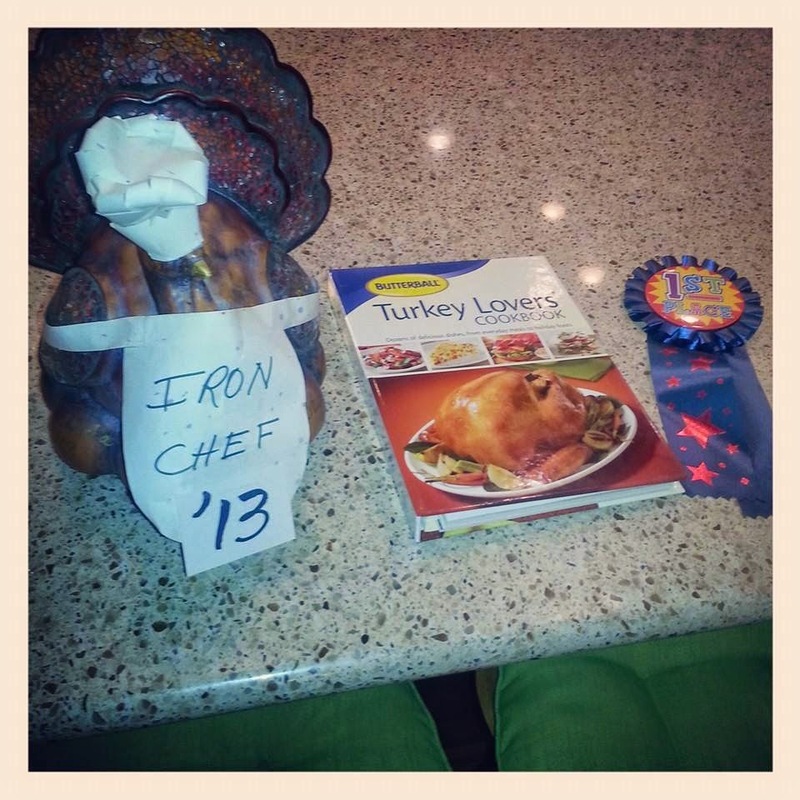 The traveling turkey must be be displayed prominently in the winner’s home during the year. It comes with a host of bragging rights and a gold marker to permanently record the name of the champion. The cooking competition has become an important tradition and a highlight of the holiday. How can you use this as an example to create something special for your family or organization? For essentially no cost, you can infuse spirit, laughter and get the creative juices flowing. Thanks to Julie for sharing the tradition and the samples! The Bon-Ton chain of department stores recently sponsored a “Community Days” promotion where non-profit organizations sold their coupon books. A donor paid $5 which the organization kept, and in exchange received a $10 coupon good at the Bon-Ton stores. In theory, it was a win-win for everyone. Except that the list of exclusions on the coupon could fill the rest of this blog. I tried to use it for 3 pair of socks. No, a single item had to be $10. I tried it on pajamas; no, they were clearance. I wanted to buy cosmetics, but couldn’t use it. It didn’t work on the Columbia brand I liked nor the Incredible Value sweater. By the time I found a t-shirt that actually worked with the coupon, I was so frustrated that I gave all the other discount coupons in the book to another shopper rather than spend the time to try and use them myself. There is a reason that “the fine print” gets a bad rap. Instead of making the “community days” so much about making money, Younkers and its related stores would have had much better PR if they delighted the donors with their coupon instead of frustrated them with it. Don’t just pretend to be generous. If you position yourself to be benevolent through a “community days” promotion, take steps to actually be generous instead of just using it as ploy for others to do your marketing for you. In a recent “Ask Amy” column, a reader was in a relationship with someone who was verbally abusive. She was asking Amy how to toughen up to walk away. I think this is true not only in personal relationships, but in all kinds of interactions. If much of your time at work is spent hearing about all the things you or your staff did wrong, you will start to believe what is said, making it harder to have the confidence to interview. If you tell yourself over and over that you are fat, soon you will be. If you continually hear from a family member that you aren’t living up to your potential, you will build a resistance to risk and the prediction will come true. Whatever is put into your head on a repeated basis wears ruts in your memory. It becomes easier to operate in that rut, rather than trying to climb out of it. If you hear people or the environment around you feeding you negative information, find ways to change that channel quickly. As hard as that may be to do, it is so much easier to switch after a few bad songs or soon it will be the only soundtrack you know. I understand the desire to capitalize on the largess of holiday spending, but the diffusion eliminates all of the impulse buying that true Black Friday used to generate. It reminds me of my birthday and how it was celebrated as a kid. All of the hoopla was on the day itself. I had cake, presents, a party and singing on the actual date. Now, in addition the natural nonchalance that comes with adult birthdays, also comes commemoration over several days. The cake is shared at work at a convenient time; presents arrive in the mail approximately near the date; I may go to dinner on the weekend vs. on the day itself if it falls during the week. While the intent is still good, the span of time dilutes the impact of the celebration. Think about the power of concentration the next time you’re tempted to spread something out. Whether planning a retail sales campaign or a birthday soiree, you’ll get a bigger bang if you shoot off all the fireworks on the same day.